Down Island Digs ~ Ideal Location Downtown, Private Pool. You would never know you're just ½ block off downtown Duval Street in Old Town Key West! Everything about this unique Key West gem adds up to make an ideal precious "down island" hideaway, right in the center of downtown. It is indeed rare to find a cottage property with such a large tropical garden in this location situated on two full private lots with such lush mature tropical landscaping. This unique vacation garden cottage was refreshed complete with new kitchen and new flooring throughout in 2009. In January 2010 a new landscape design was created for the back garden and the swimming pool was re-stored to brand-new condition. If you have stayed at Down Island Digs before or if you’ve heard about it, you’ll love the upgrades and attention to detail of this authentic vintage circa 1918 historic island cottage. While we have honored its well earned charm, we have added lots of spice and luxurious comfort features. The focus of this property is definitely the Key West quintessential indoor / outdoor living that makes island life so relaxing and wonderful. The entire large back yard is made very private with high fences and is visually divided into two parts. The front part of the garden is an expansive pool deck which is joined by sliding glass doors to the living room and pool side bedroom. The deck surrounds the graceful lounge pool which you enter down a graduated underwater stair case. Beyond the sun deck walk toward the back and the deck leads you down the middle of the yard into the large native tropical shade garden. In contrast to the expansive garden, the indoor living room area is made cozy and charming. A whimsically painted sideboard and home spun dining table command the space between the indoors and the outside. Then sliding glass doors open up the space by connecting the decks on all sides of the living room and draw guests onto the deck to the outdoors. Plenty of pool side seating under a pretty awning create an irresistible tropical indoor / outdoor living room comfortable for lounging. The U-shaped kitchen is open to the living room area. It is updated and easy to cook in. It is fully equipped, offers a full size electric range and dishwasher, and has a nice open view of the pool and garden so the cook can be part of the party. Throughout the property inside and out are whimsical pieces of island art by local artists. Inside, the cottage has new floors throughout the living room, kitchen, and bedrooms that feel nice to bare feet. The bedrooms have a tropical flare and are comfortable and inviting. The pool side bedroom offers a queen size bed and has sliding glass doors that open out directly onto the pool deck. The master bedroom has a white 4-poster king size bed and is set up as a suite with a queen size sleeper sofa sitting area as well as the bed. The master bedroom has direct outdoor access to a front porch for sitting and watching the world go by. Additional bedding is offered with a twin sleeper sofa in the living room area. 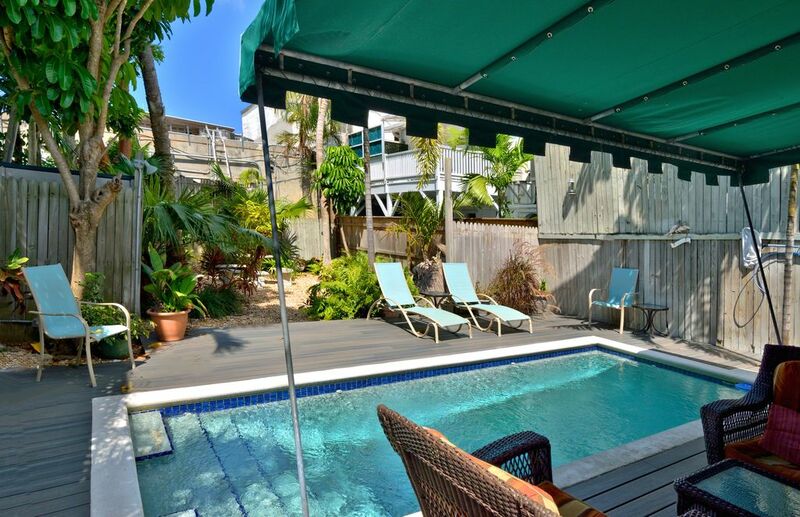 This downtown Key West property is located right next door to our Pavilion Villa. The downtown location is just around the corner from famous Duval Street and steps from grocery shopping, excellent restaurants, popular clubs, the Historic Seaport, and tropical shops makes this one of the most requested and convenient accommodations in Key West. We are so pleased to offer it as one of our more unique properties available in Old Town. This home is offered as an exclusive vacation rental in the most requested location in Key West. The property will not tolerate smoking inside. Perfect Key West location just around the corner from Duval Street plus this adorable cottage offers a very large and beautifully landscaped back yard that is hidden from view. While this cottage is in downtown Key West it has a large tropical tree garden in the back yard that is hidden from view. Perfect location and backyard. Bit noisy in the morning. This house was perfect for our recent trip to Key West. The house is only a half block off Duval Street at basically the midway point. When we arrived we parked our rental car in the provided parking spot and didn’t move it until we were driving back to the airport. The location made it easy to stop in and out during the day to drop off souvenirs or at night if a member of your group doesn’t want to stay out as late. The backyard is surprisingly big and has a nice table where we had our Cuban Coffee Queen (only a half block away) breakfast in the morning. The pool is heated which was great with the temperature being in the mid 60’s when we were there. We brought some Bluetooth speakers to play music while hanging in the backyard. Despite the property backing up to Duval St, the backyard does feel a little secluded if the crowds are too much. The bedrooms and bathrooms are nice as well. Plenty of towels provided including 4 beach towels for the pool or if you book a boat trip with snorkeling while you’re there. The only negative for us was the loading dock for the grocery store being directly across from the house. They do start early so if you’re a light sleeper that would be an issue. If I plan another trip to Key West I would definitely try to book this house again. We are thrilled that you enjoyed the property and all amenities! Having a heated pool is definitely great, especially when the temperatures drop! We hope you will visit us again soon! Perfect location and setup. Hopefully again next year! Thank you for choosing VHKW! We are happy to hear that you enjoyed the property. Please do come back and stay with us again next year. Nice property and location. Not worth the price. Very nice house and pool deck at a great location - close to Duvall and within walking distance of other areas. Very private, relaxing, and comfortable until the grocery store across the street starts their morning loading operations around 4:00 to 6:00 a.m., at which point the sound of idling diesel trucks and banging are constant. The air conditioners in the bedrooms worked well but the living room area could not be cooled to a comfortable level. With all of this being said, the house and the pool/pool deck were all great and well-taken care of. However, it seems overpriced given the small, easy improvements which could be made to enhance guests' comfort and experience. Loved the house, pool and location. Very comfortable and close to everything! The only negative I would say and it certainly would not stop us from coming back is that the bedroom and living room do not cool down. The air conditioner is for both rooms and does not meet the need. The master bedroom air works great and was extremely comfortable. We would stay again for sure! The parking spot was a little difficult to find but we figured it out with a little patience. Absolutely a great find and enjoyable stay! 5 sisters on holiday had a great time. The location was perfect and the house was great for us. The living room is super small but the outdoor patio was lovely and that is where we spend our time. What did you most enjoy about your stay? Would you come back again or recommend this home to a friend? Was the property a good fit for the group you were traveling with? What nearby activities, attractions, or restaurants did you enjoy? Duval Street is just around the corner. Don't miss the variety of public tropical gardens you can tour. The famous sunset on Mallory Square is a nightly event. For cancellations made 90 days or more prior to arrival date, the guest is entitled to a full refund less a $375.00 cancellation We do not accept guests less than 25 years of age unless accompanied by a family group or guardian.